Daredevil, the rare character who gained powers after deciding to perform a heroic act. By Andrew Scott — What makes a hero? It’s a simple question with a complex string of not-so-simple answers. If one’s actions are what determines one’s character, though—as F. Scott Fitzgerald posited— then how can we best understand true heroism within the confines of the superhero genre? The Fantastic Four, Spider-Man, and even Captain America were just in the right place at the right time (or wrong place/wrong time, depending on your perspective). 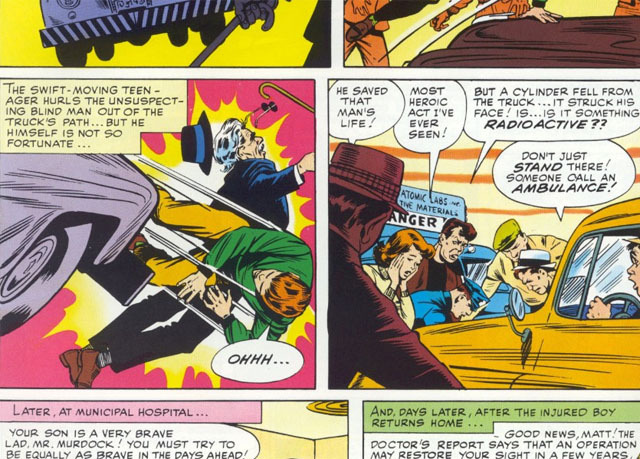 Reed Richards and crew were, let’s face it, kind of dumb to fly into space only to be belted with cosmic rays. Spider-Man was bitten by a radioactive spider during a school trip. Captain America just happened to be rejected as 4F while an Army scientist with kooky ideas was nearby and recruited him into the secret Super Soldier program. The Flash? Freak accident. Superman? Sure, his Kansas family raised him right, but the power of our yellow sun pulses within every one of his Kyptonian cells, whether he likes it or not. Batman’s parents were killed, and his actions are informed by that tragedy, but it’s still something that happened to him. Mutants are, like Lady Gaga, just born that way. They have no choice. All of those gods and goddesses—well, divinity has its privileges, I guess. And forget anyone who possesses some kind of object that grants them special powers, whether it's an amulet, a ring, whatever. But Daredevil? Matthew Murdock was a hero before he gained his superpowers because he chose to perform a heroic act. He pushed a blind man out of the way of an oncoming vehicle that was carrying radioactive material. The toxic goo blinded him and enhanced his other senses. But his actions made him a hero first. Check out Andrew Scott’s recent interview with artist Peter Krause, and check back to the site Wednesday for a review of this week’s new Daredevil #1. Andrew Scott is the author of Naked Summer: Stories. He has written for dozens of outlets. He lives in Indianapolis. You can find him on Twitter: @_AndrewScott. 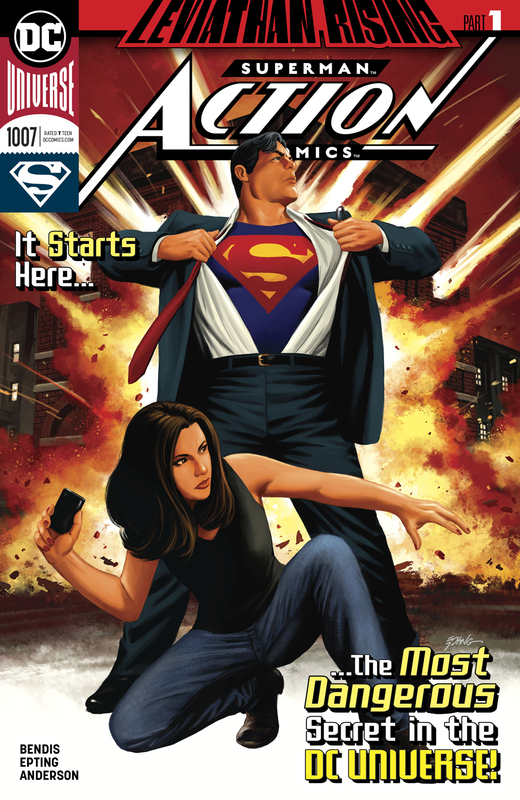 Action Comics #1007 came out 1/30/2019. By d. emerson eddy — Last year, Brian Michael Bendis walked across the aisle in terms of Big Two comics publishers. After nearly two decades of shaping the Marvel Universe, he hung up his Spider-tights and donned a pair of red underoos at DC. It was a pretty big deal, probably one of the biggest exclusivity changes we've seen in the past 10 years. Some people cheered, some jeered, some waited patiently to see what would occur. I shrugged, because I wasn't reading any DC Comics at the time of the announcement and wouldn't again until recently. I just knew I was going to miss Bendis' writing on Jessica Jones and Defenders. Fast forward to late last year, when the temptation for The Sandman Universe and Jinxworld titles became too great. I started with those titles, before giving the broader DC Universe a chance again. Although I may have some trepidation at some bleaker corners of their publishing, I feel like Brian Michael Bendis has become like a shining light for them, a light in the darkness. 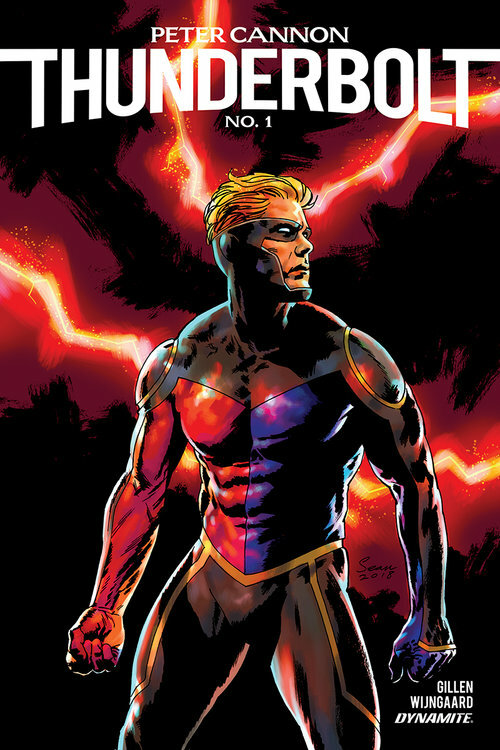 With the Superman titles, Wonder Comics, and Jinxworld, I feel like he's been rejuvenated. Some of his familiar writing quirks are still there, but not to excess. The dialogue tics and decompressed storytelling approaches are present, but not at the point where they feel overboard. And Cover and Pearl (with the inimitable David Mack and Michael Gaydos respectively) feel like some of the freshest, most inventive work that he's written in years, possibly ever. It could be the excitement of playing in a new sandbox, but that joy, wonder, and freshness carries over into the Bendis-penned Superman titles as well. People may argue about Superman itself, but I feel like he's nailing Action Comics month in and month out. Action Comics #1007 begins “Leviathan Rises” (or “Leviathan Rising” if you go by the cover) that promises to unearth secrets of the DC Universe, and this is a promising start. There have been hints of things going on since #1001, but this issue starts with a bang when it comes to someone targeting other shadowy organizations. It's a decent hook, but what particularly puts the story over the top here is a personal moment between Lois Lane and her father. I won't spoil it, but it's a conversation that will have huge ramifications and is something that you probably don't want to miss. Steve Epting joins the series to provide the line art for this arc, a perfect choice. Shadowy conspiracy and espionage-tinged stories are his forte, and he shines here. Despite the brightness of Superman's world, he brings a tinge of darkness from the corners in the attacks on the other secret societies and black ops organizations. Those attacks are also beautifully enhanced by the explosion effects provided by Brad Anderson. It's nice to see the contrast between Superman's bright, bold colors and the darkness of an organization like Kobra as well. I'd also go back to the conversation between Lois and her father, wherein Epting and Anderson play it out like a spy meeting her handler for the first time in years in its composition and coloring, adding a nice tension to the entire scene. And Josh Reed serves as the backbone again for the series with his lettering. There's a quite nice effect with the “Faith to Kali Yuga!” chants. Overall, Bendis, Epting, Anderson, and Reed provide a good jumping-on point here with Action Comics #1007. Although it does build on what's come before, it's not absolutely necessary to have read since the run started with #1001, giving you more than enough to be hooked by this issue alone. The mystery of the attacks and the character work pretty much make this unmissable if you're a Superman fan. It's also laying some of the groundwork for the future of the DC Universe. I'd suggest getting in now. By Zack Quaintance — This is pretty much a perfect week for new comics, featuring as it does the launch of multiple exciting new #1 series (the bright shiny new toy to the long-time comics fan) as well as the return of some of the best books on the market right now, including a new arc for Wasted Space and the conclusion of the phenomenal Archie 1941. Plus, books like Die continue to establish themselves as wonderful new comics. There is, simply put, a lot going on this week, and so here we are as always with a brief guide: Top Comics to buy for February 6, 2019. As is standard protocol, we’ve selected our top 5 (plus a pick of the week), listed the most-exciting new #1 issues, and thrown-in for good measures the others that received votes. The top 5 are more heavily weighted toward books that have already established them, but rest assured, you can’t go wrong this week checking out anything from Female Furies to G.I. Joe: Sierra Muerte. Just choose wisely, there are a ton of stellar comics to pick from. And now, on to the actual comics! Why It’s Cool: It’s a young year, but this is easily a front-runner for the best single issue of 2019 at this point. This entire series—which re-imagines Archie set in 1941 (incidentally the year he was created) during WWII—has been something truly special. With a different sort of fandom than superhero comics but no less an iconic history, Archie Comics as a publisher is generally freer to use its characters for alternate takes, or at least such has been the case in recent years. While the horror comics and Life With Archie have all been interesting, this is the prestige picture in the bunch, a comic with impeccable historical research, a deep emotional core, and unbelievable artwork courtesy of Peter Krause. This is not to be missed. 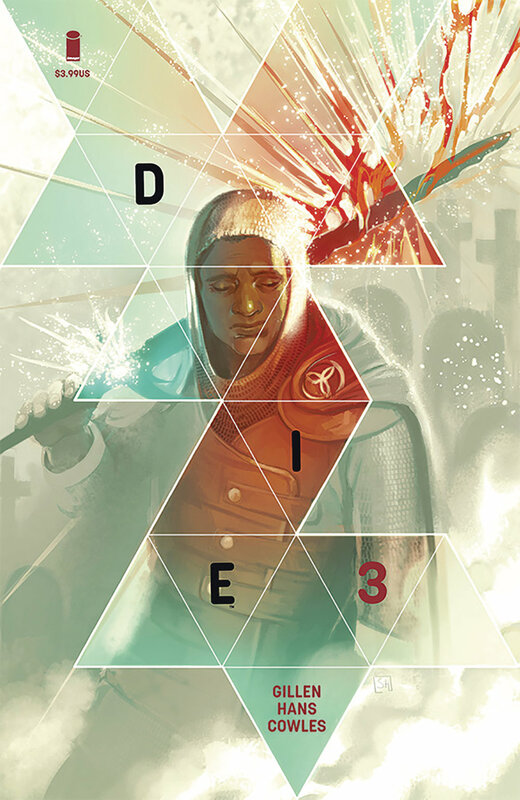 Why It’s Cool: As we wrote in our reviews of Die #1 and Die #2, this comic is one of the most-exciting new creator-owned books in some years, combining as it does the recent trend of teen D&D nostalgia with the dark lessons of life's hard-lived. Well, this third issue to the book feels like a bit of a thematic pivot. Fantasy has always been inherent to this title (the basic premise is that years ago six friends went into a realized fantasy realm via a role-playing game and only five came out—and now those five have been pulled back in), and this comic looks at some of the real-life inspiration for fantasy as we know it: WWI, which Lord of the Rings progenitor J.R.R. Tolkien himself was a veteran of. Essentially, this is a gorgeous and sadly poetic comic that draws a shattering parallel between fantasy games and stories we enjoy, and the real-life strife that helped to create them. Why It’s Cool: Last week’s Justice League Annual #1 was my favorite issue of the Snyder/Tynion/Cheung/Jimenez Justice League era to date, but it won’t reign long—this one is even better. 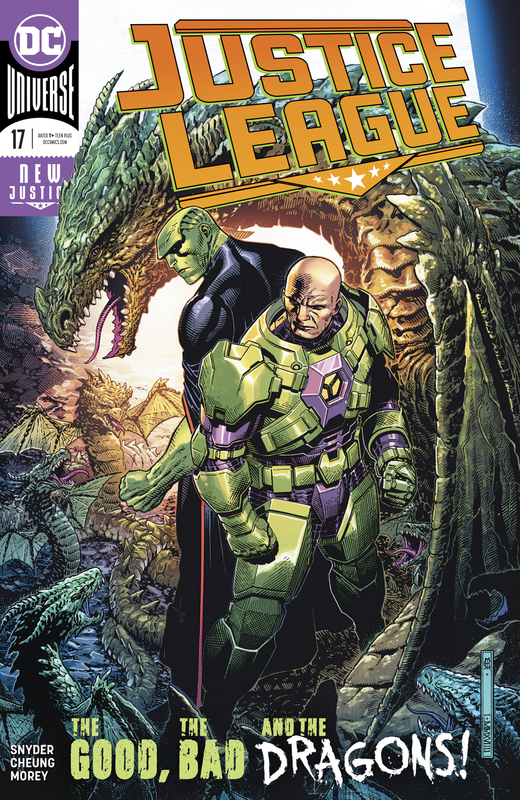 Since No Justice ended, my favorite element to this complex and grandiose run has been the idea of Martian Manhunter and Lex Luthor essentially captaining their opposing teams in a conflict of ideology wherein both thinks they are doing what’s best to save the multiverse or at least the Earth. This story takes that concept to another level. I won’t go into how, but it’s a sight to behold. Highly recommend this. Why It’s Cool: Way way too many disparate properties these days are getting compared to Game of Thrones. In fact, I feel like it’s become reductive pop culture short-hand for something I like that’s slightly beyond average scope. But! 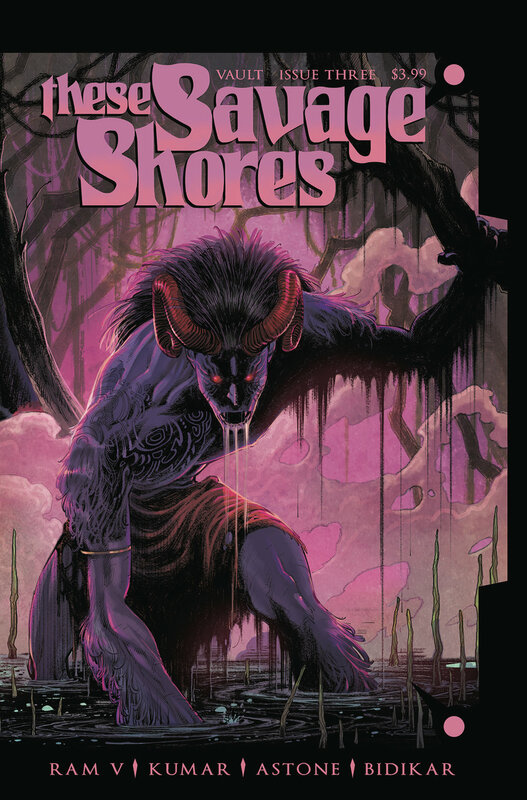 Try as I might, I can’t help but describe this third excellent issue of These Savage Shores as feeling in scope a bit like Game of Thrones. It just has so many of the elements: large-scale political machinations, alliance building, betrayals, and seemingly inconsequential deaths having ripple effects that seemed destined to have retribution due. These Savage Shores also remains a gorgeous comic, as lush with its artwork as it is lyrical in its dialogue and narrative prose. If you’re not reading this comic, I don’t know what to tell you at this point. Why It’s Cool: One of my absolute favorite comics of 2018 is back, and it’s at the same high (sorry) level it was when we last saw it. This issue has all the hallmarks of this series: the humor, the high-minded philosophical contemplations, the subtextual commentary on the modern world, and the ever-looming threat of even more space nukes that might destroy the world. It is, in other words, a very very good comic. We’ll have a review of this book later in the week, but know now that each and every one of you should be reading this. Sign up for a weekly update from Batman’s Bookcasecase . The Saga Re-Read: Saga #26, to fight or not to fight? Saga #26 was originally released 3/4/2015. 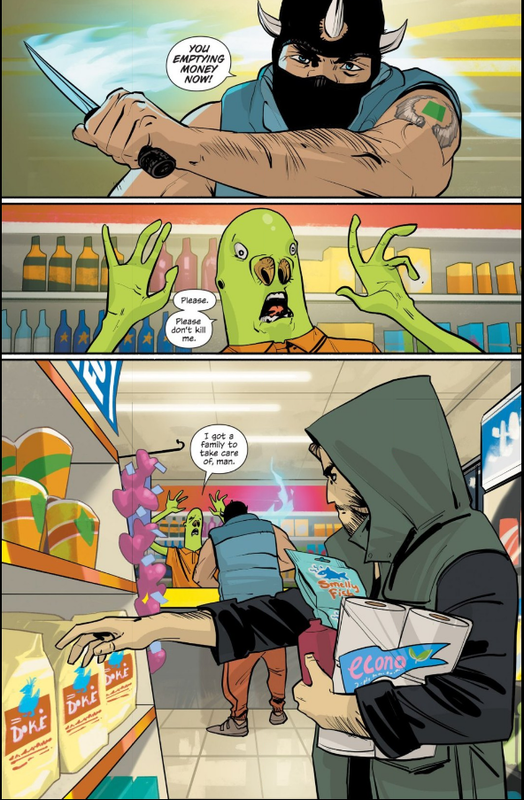 By Zack Quaintance — Saga #26 is almost—but not quite—one of those comics that seemed bent on making its readers mentally decide what they would do in a given situation...would they accost the man robbing the convenience store or fade into the back and hope he doesn’t notice them? Would they fight the dragon monsters trying to eat them or listen to the little girl suggesting they should talk? Would they stab the TV-headed terrorist in the neck with the shiv or join his anti-establishment revolution? Okay, so maybe these aren’t all relatable within the context of our everyday lives (and I’ll go into what I think they mean later), but there is a shared question to them all: would you use violence or try to find another way? This isn’t a novel question within the context of the series. Hell, in some ways this is a war book, meaning would you fight is the question all along, but this issue embraces the episodic format and uses that question to show readers more about each character. This, I must admit, is yet another little bit of craft I didn’t notice my first time through. Well, hot damn! After not getting much (or really any, excepting the last issue) of Gwendolyn and The Will in the last arc, this new one is a veritable bonanza of continuing their story. I’m there for it. I like them well-enough and love (as regular readers well know) Lying Cat as a narrative device. Anyway, onward to the individual elements! The Cover: Another busy cover with a lot going on, and I hadn’t even recovered from the hella busy cover for Saga #25 yet! But yes, this cover is packed. The main thing is, of course, Gwendolyn using a wooden staff to prop open some lizard beast’s mouth as it tries to eat both her and Sophie. I kind of like Lying Cat looming over and side eye-ing the whole deal, but, overall, this isn’t one of the more memorable Saga covers for me. The First Page: Whoa whoa whoa! Another first page split into panels. Memory is a funny thing, like a boat filled with holes plugged by assumptions. For my part, I guess I’d assumed that the entirety of the series was all one-panel splash pages openers. I certainly think now that the series will get back to it at some point, but can you really trust me after that last confession? Probably not. Anyway, this one is a bit of a trope: Marko shopping in a convenience store in the middle of a robbery—something that happens to a strong majority of fictional characters but never to anyone I’ve ever met in real life. This does that always-interesting Saga thing of directly juxtaposing the fantastical and alien with familiar activities or imagery from real life. The Surface: Marko goes on to break up that robbery in a fit of violent rage (more on that in foreshadowing). Marko’s not the only one who has to face down a tense situation. Alana, Marko’s mom, and Hazel are all still hostages of Dengo as the Revolution arrives, while Gwendolyn, The Brand, Sophie, and Lying Cat are on the brink of being eaten by a bunch of dragon mares (as they search for a bull dragon to get The Will medicine he needs). The Subtext: The metaphor here has much to do with the way raising children means you spend time with odd adults you might otherwise never met. It’s not the most subtle point, though, given that Hazel’s own narration basically comes out and says that, as it is often wont to do with this series’ subtext. In a larger ideological sense, the subtext in Saga #26 has to do with perspective. Meaning, from one perspective the Revolution might look like freedom fighters, but from another terrorists. With the media manipulation we’ve dealt with so thoroughly in recent years, this is a topic that should resonate as much (if not more) today than it did when this comic was new almost four (!!) years ago now. There’s also a question raised that I think about a lot, which is does combating powerful opponents justify extreme tactics? Like the best fiction, the book leaves the answer largely to the reader’s interpretation. There’s other, more prominent, subtext here as well that serves as a double commentary on gender roles, toxic masculinity, and the way violence begets violence. The majority of the male characters in this story have often resorted to violence. Marko does so again to solve his robbery problem, Prince Robot IV is a very violent character tormented by visions of his now-dead wife, who Dengo (yet another male character) is torn with guilt over murdering. Our central female protagonists, meanwhile, solve their problems with diplomacy...eventually. Lending this issue that commentary (although Gwendolyn and Alana were both leaning toward committing violent acts when something else got in the way). This whole sequence had enough action for multiple splash pages. Check out past installments of our Saga Re-Read.